This wizard converts the current macro into a Repeating Macro. 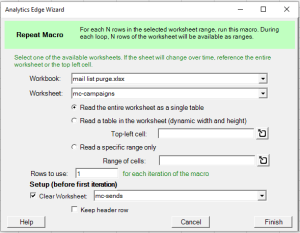 Repeating macros allow you to load a tables of values from a worksheet to be used as Analytics Edge named ranges while running the rest of the macro. By default, the macro will be repeated for each row in the table loaded. For example, if the selected worksheet contains a column labelled ‘id’, other functions in the macro can refer to the range name [id] in place of a website view id number or email campaign id number. Each pass through the macro would process a different view or campaign. Workbook / Worksheet: The referenced worksheet can be from a separate workbook, so that the list of account information is not included in the refreshed workbook. This is especially useful when refreshing a template report for a list of clients, so the client list is not part of the workbook you send to the client. Rows to use: The function also allows you to process more than 1 row per cycle. The rest of the macro will have to know how to process more than one value in the ranges. Setup – Clear Worksheet: Before the first row is processed, a selected worksheet can be cleared of all data. This can be used with Append To Worksheet to process all rows and combine the results to a target worksheet, clearing the data before the macro is run. 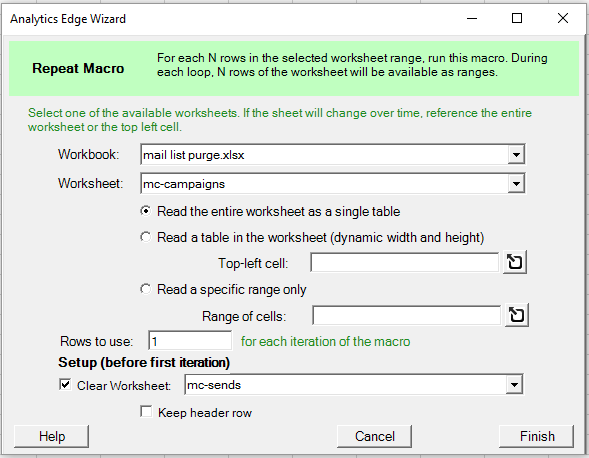 Keep header row: option to keep the header row of the target worksheet when clearing the data. This is useful to maintain the order of the columns when using the AppendToWorksheet function.